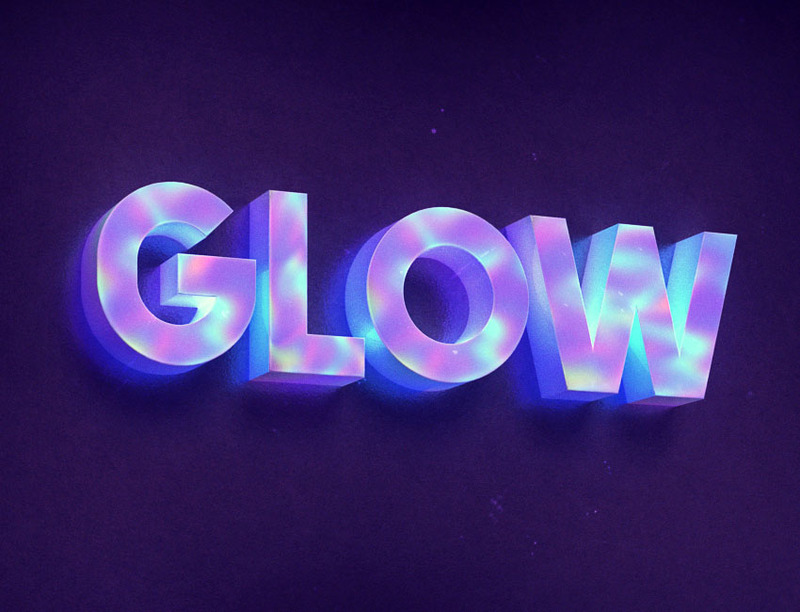 This tutorial will show you how to use Photoshop’s filters, adjustment options, and layer styles to create a hologram-inspired texture, and use it along with the 3D tools and settings to create a 3D hologram text effect with a bit of a retro feel. Let’s get started! 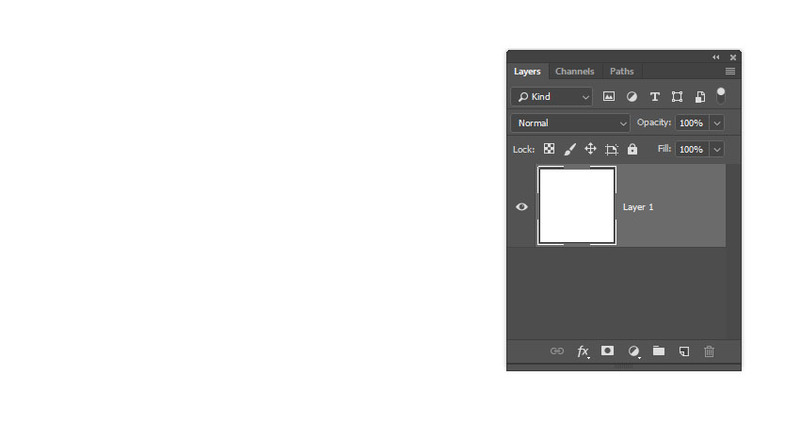 Create a new 1000 x 1000 px document, and double-click the Background layer to convert it to an editable layer. 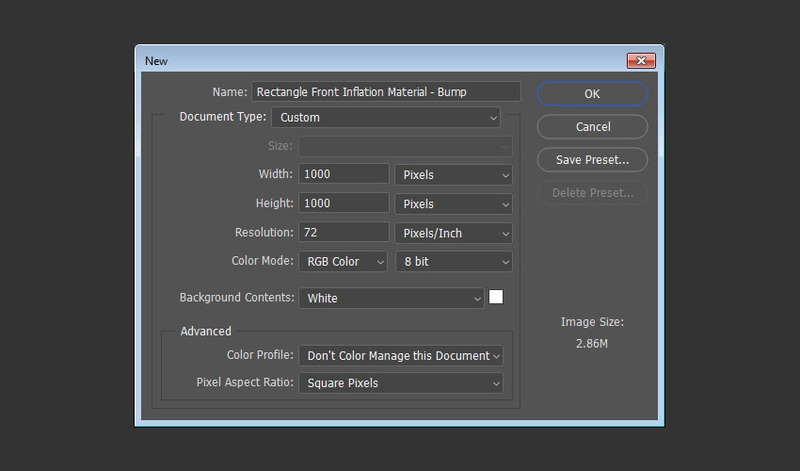 Right-click the Layer 1 layer and choose Convert to Smart Object. 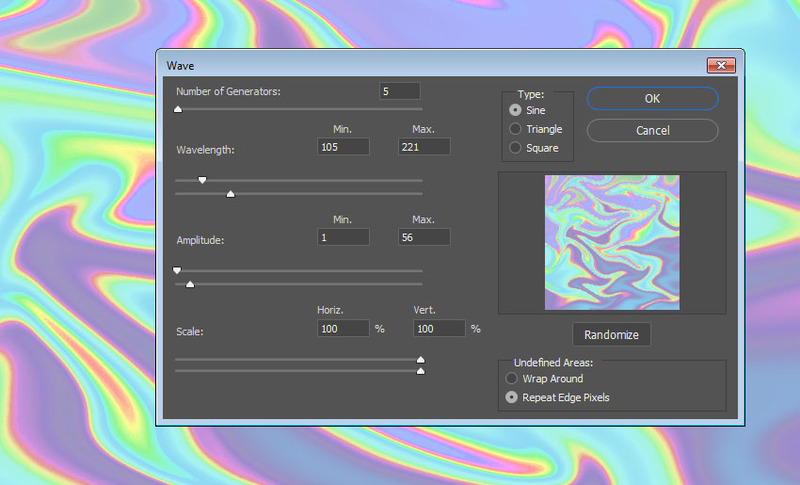 Go to Filter > Liquify, and use the Forward Warp Tool to click-drag the gradient to mix its colors together. 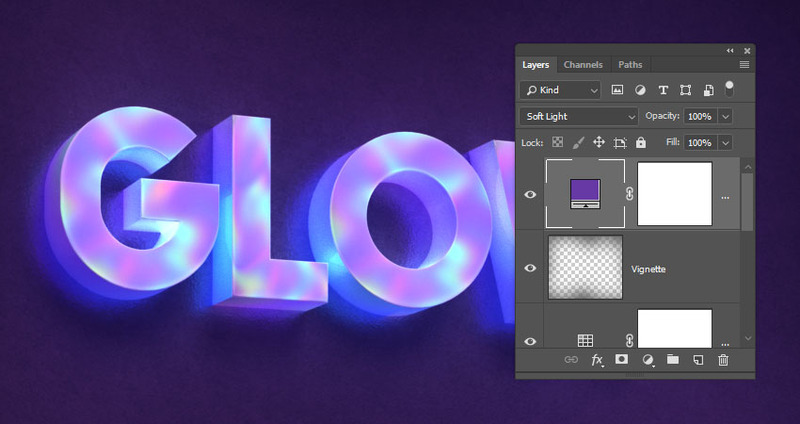 Use a quite big brush tip, and make sure to fill any empty edges you get by dragging colors to them. 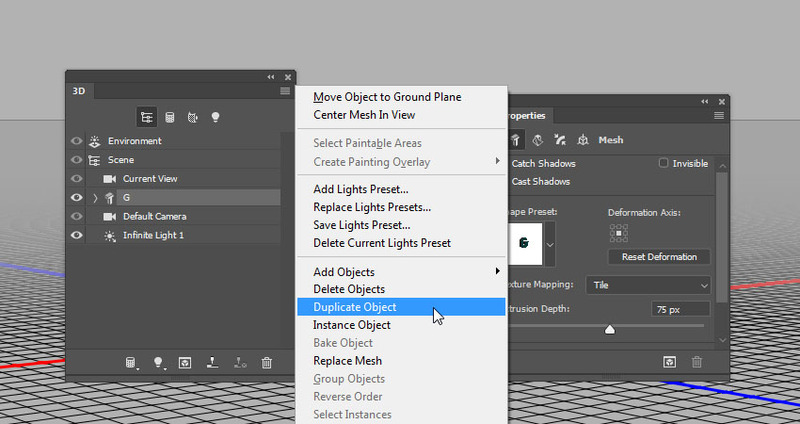 You can also adjust the other Properties you have to get a result you like. Click OK when you’re done. 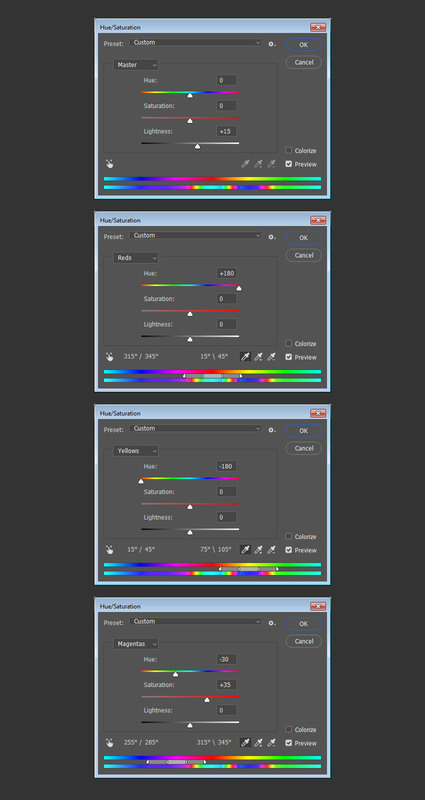 Go to Image > Adjustments > Hue/Saturation, and adjust the different Channel values to get a coloring you like. 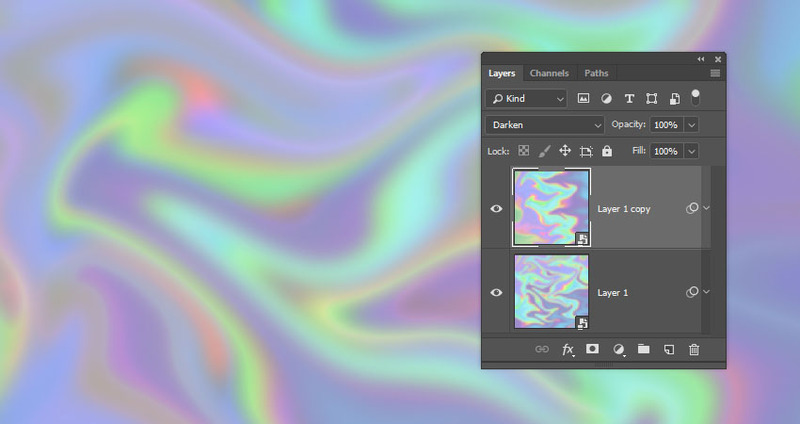 The aim is to get a bright hologram-like coloring. 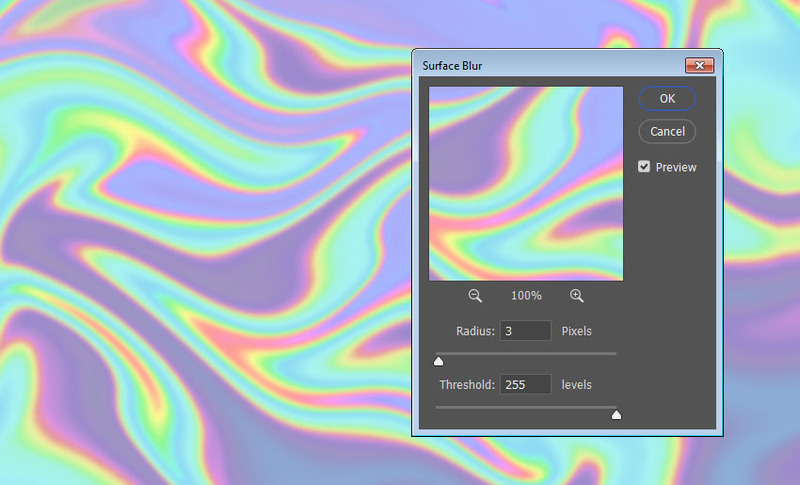 Go to Filter > Blur > Surface Blur, and change the Radius to 3 and the Threshold to 255. 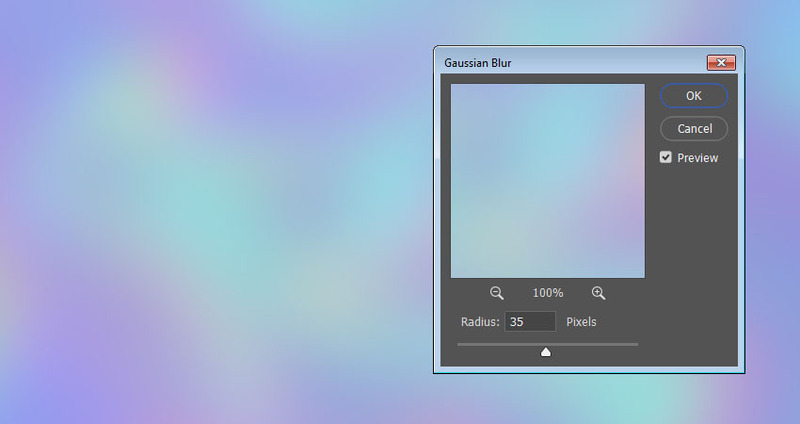 Go to Filter > Blur > Gaussian Blur, and change the Radius to 10. Duplicate the Layer 1 layer. 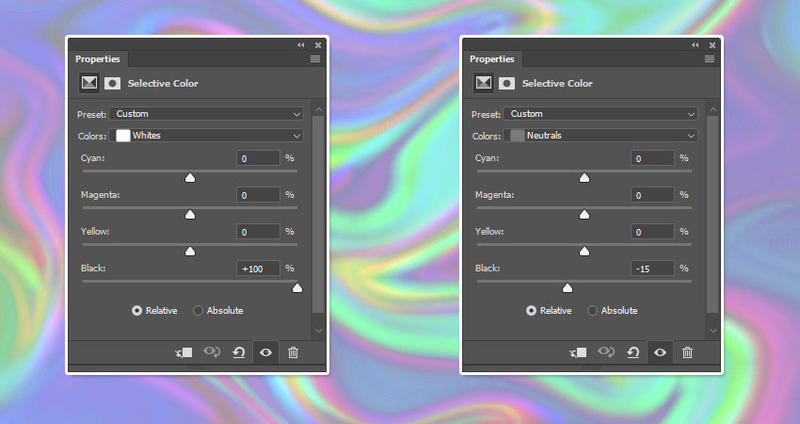 Go to Edit > Transform > Rotate 90° Counter Clockwise. 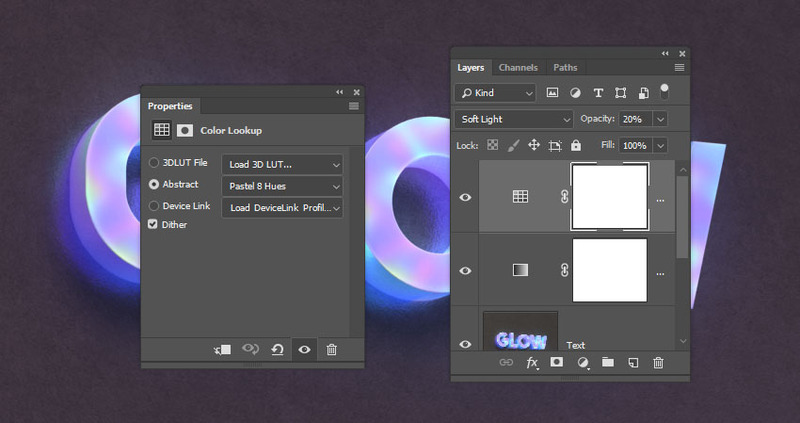 Change the copy layer’s Blend Mode to Darken. 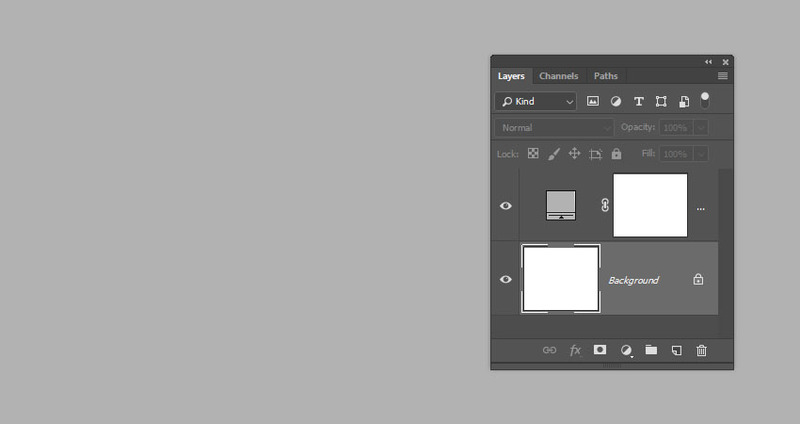 Create a new layer on top of all layers, name it Overlay, and press the Command-Option-Shift-E keys to create a stamp. Convert the Overlay layer to a Smart Object. Change the Overlay layer’s Blend Mode to Screen. 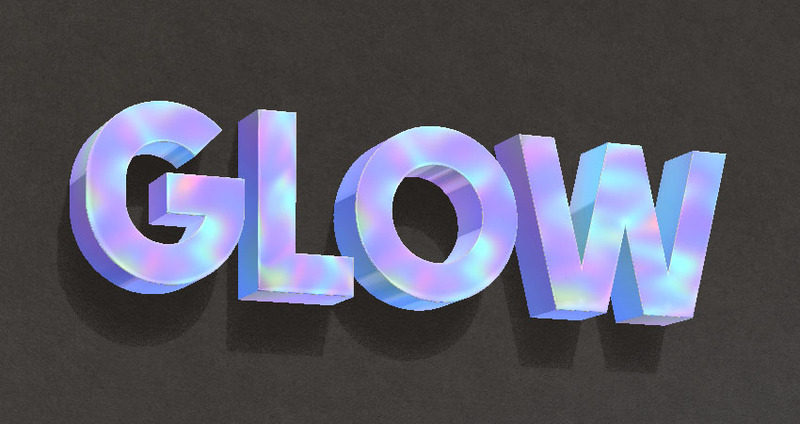 This will finish the main hologram texture, but because we’ll be using it with a 3D text, we’ll need to darken it some more first. 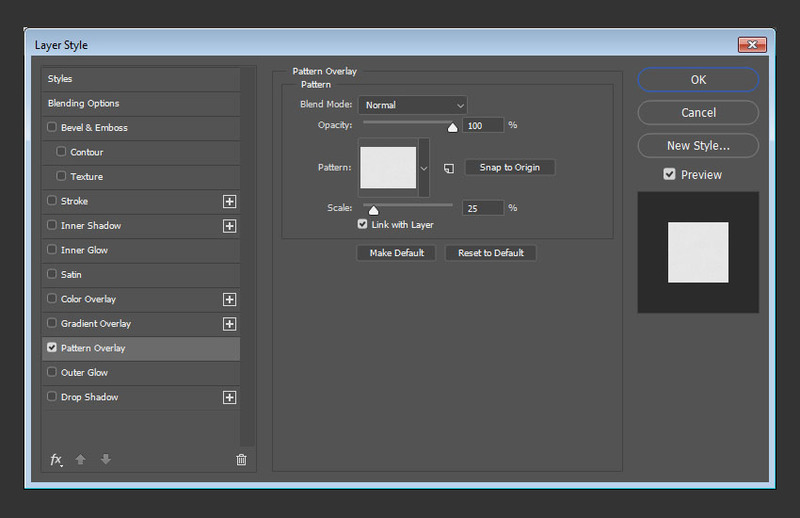 Click the Create new fill or adjustment layer icon at the bottom of the Layers panel and choose Selective Color. 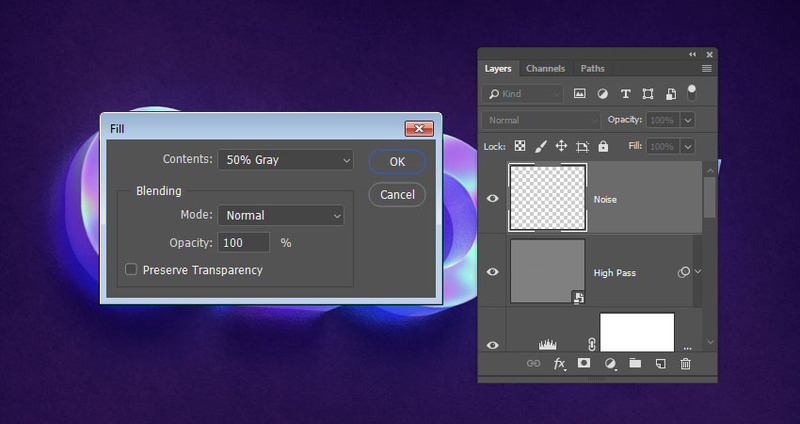 Choose Whites from the Colors menu, and change the Black value to 100. 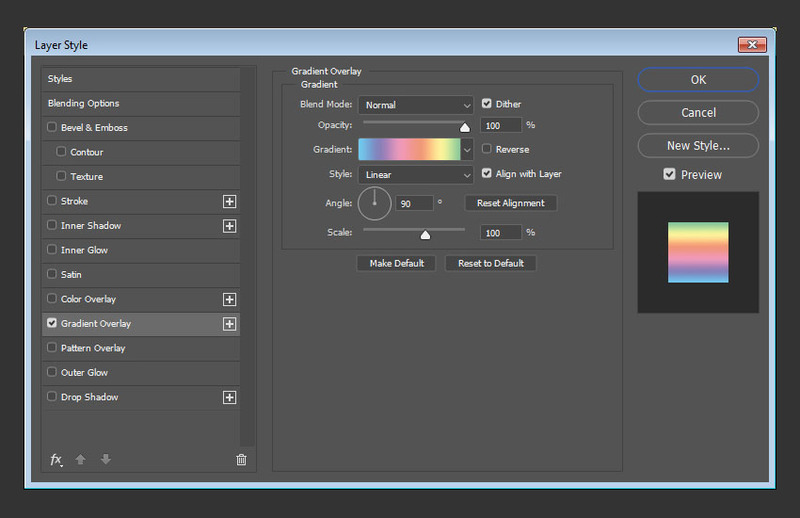 Then choose Neutrals from the Colors menu to change its Black value to -15. 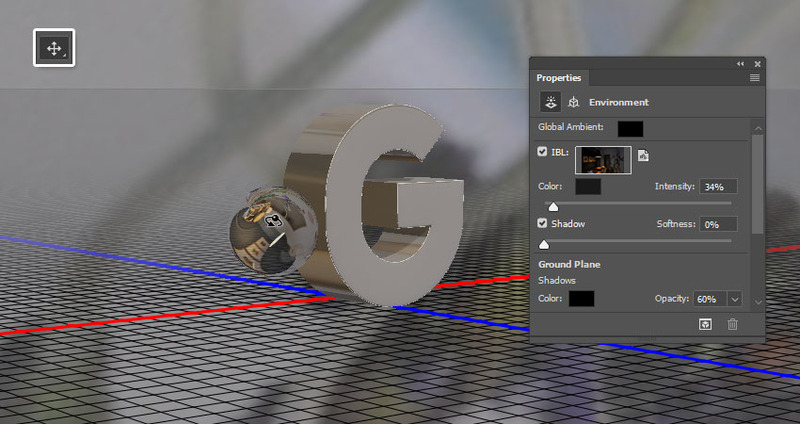 Create a new layer on top of all layers, name it Darken, create a stamp, and convert the layer to a Smart Object. 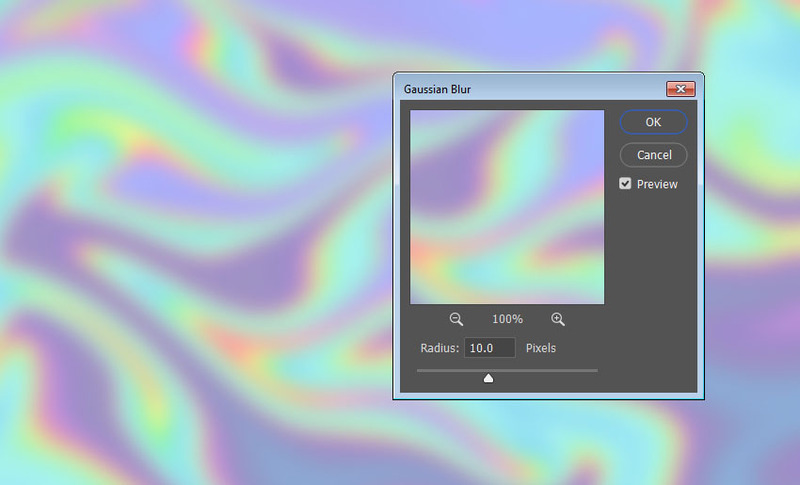 Go to Filter > Blur > Gaussian Blur, and change the Radius to 35. 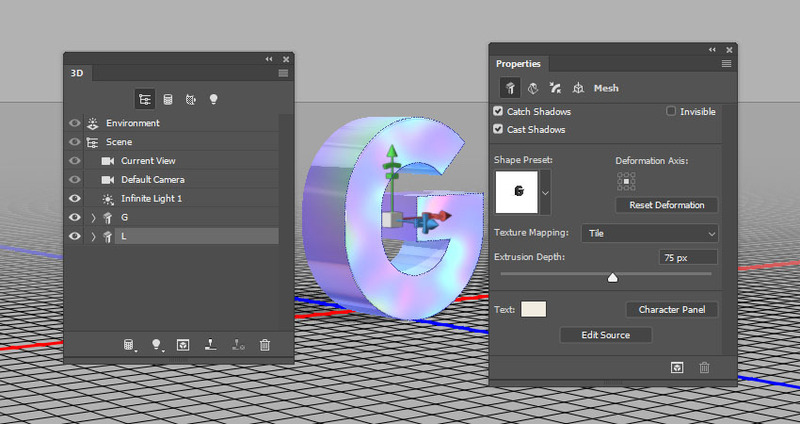 Go to Image > Adjustments > Levels, and change the Shadows value to 53 and the Gamma to 0.39. 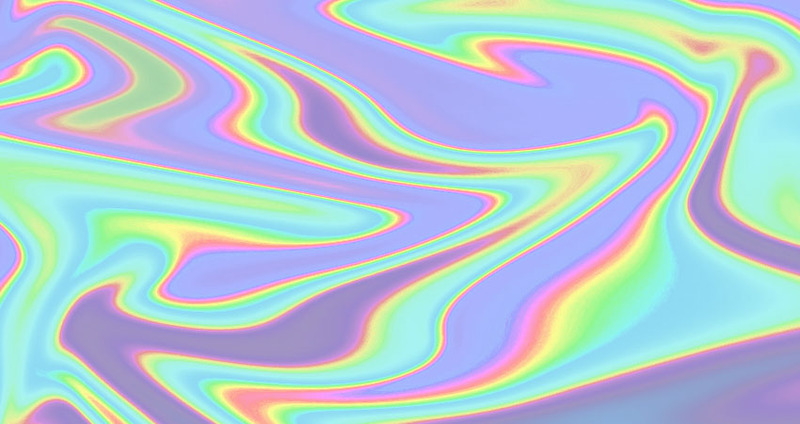 Save this file with the name Holo Texture, and you can save an image copy of it if you like as well. 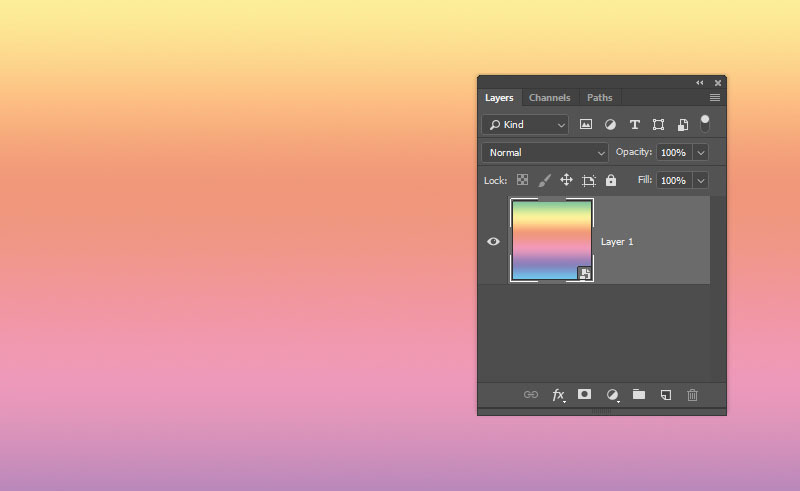 Create a new 1000 x 850px document, and add a Solid Color fill layer using the Color #b2b2b2. 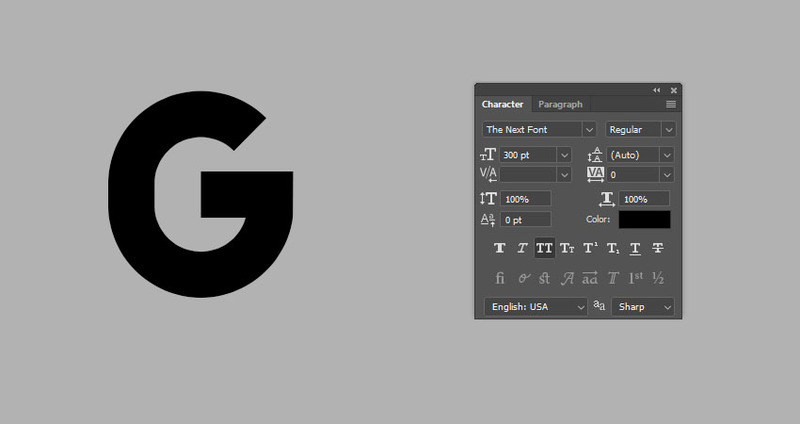 Create the first letter of your text using the font The Next Font, and change the Size to 300 pt. 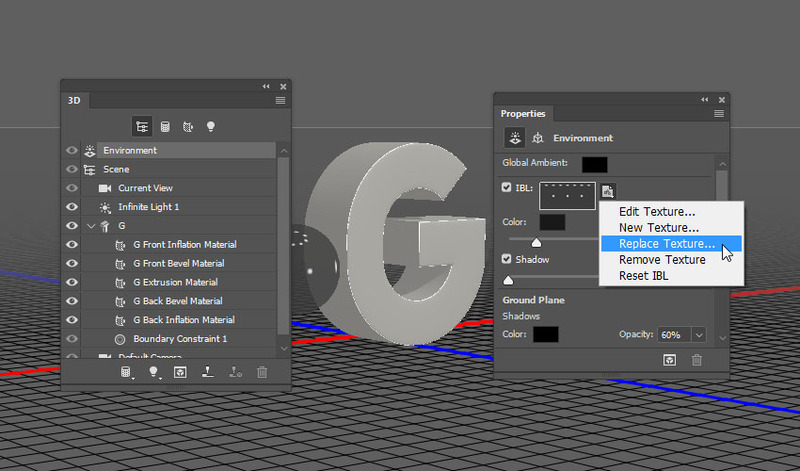 Select the 3D mesh tab in the 3D panel, and change its Extrusion Depth in the Properties panel to 75. 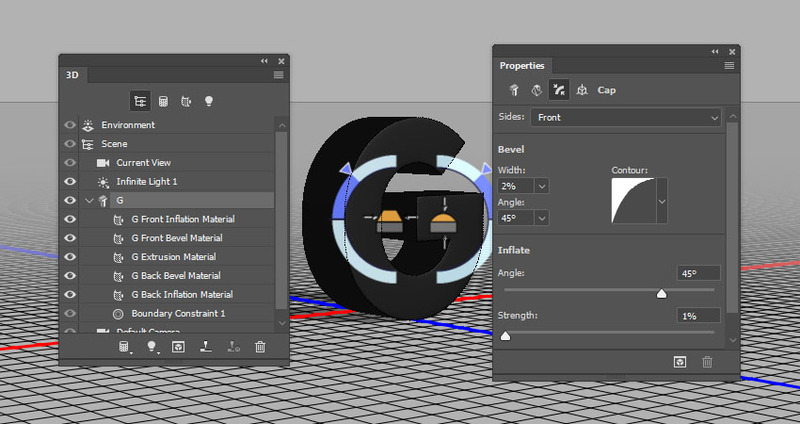 Click the Cap icon at the top of the Properties panel, and change the Bevel Width to 2%, the Contour to Half Round, and the Inflate Strength to 1%. 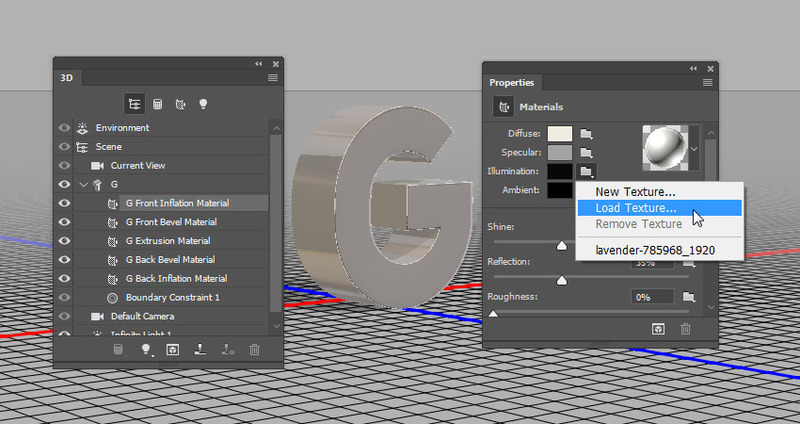 Select the Extrusion Material and change its Roughness value to 20%. 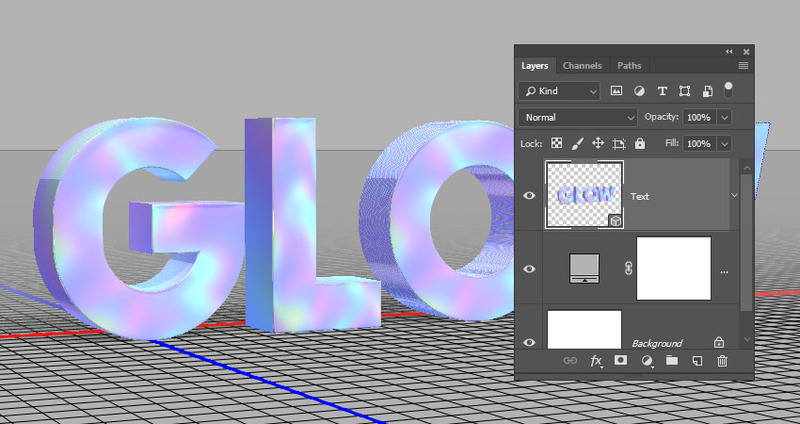 Before we add the hologram texture, we need to adjust the lighting. 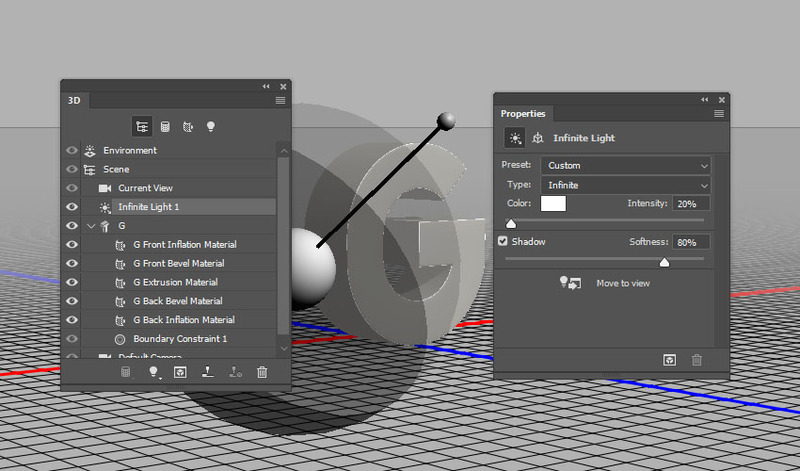 Select the Infinite Light 1 tab, and change its Intensity to 20% and its Shadow Softness to 80%. 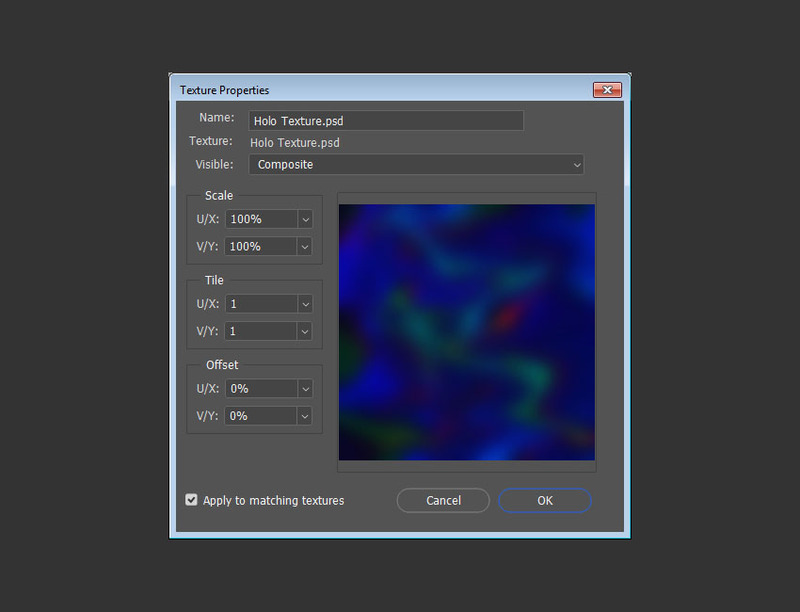 Select the Environment tab, click the IBL texture icon, choose Replace Texture, and open the Dining Room image. 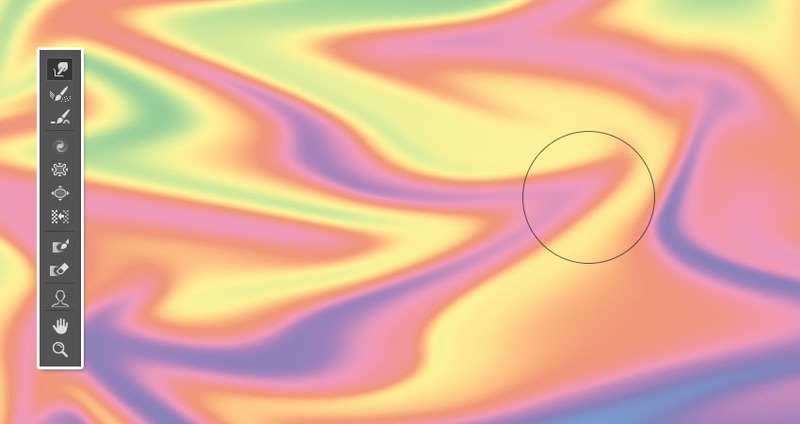 Change the Intensity to 35%, and move the image around to get a result you like. 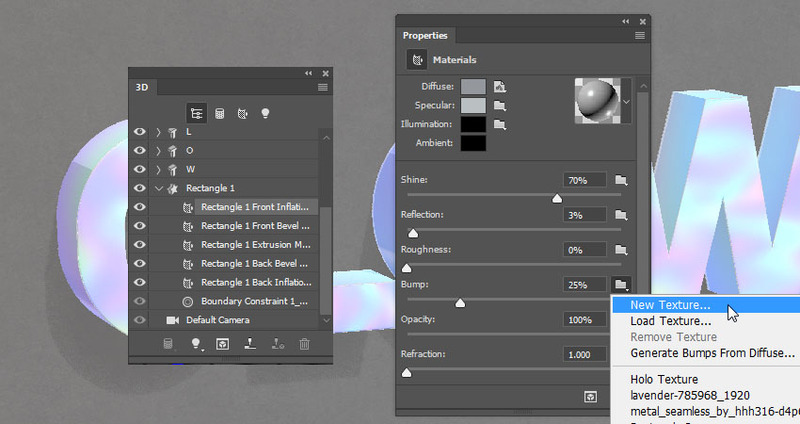 Select the Front Inflation Material tab, click its Illumination folder icon, and choose Load Texture to open the Holo Texture you created at the beginning of the tutorial. 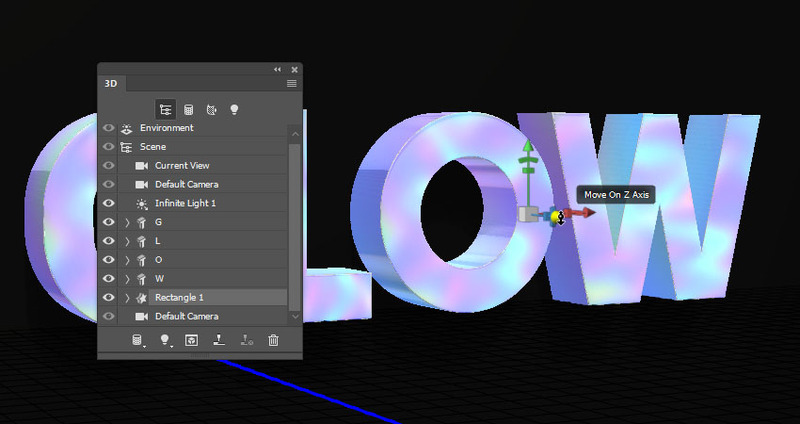 Click the Illumination texture icon and choose Edit UV Properties. Set the Tile to 1 and the Offset values to 0, and click OK. Select the Extrusion Material tab, click the Illumination folder icon, and choose the Holo Texture name from the menu. 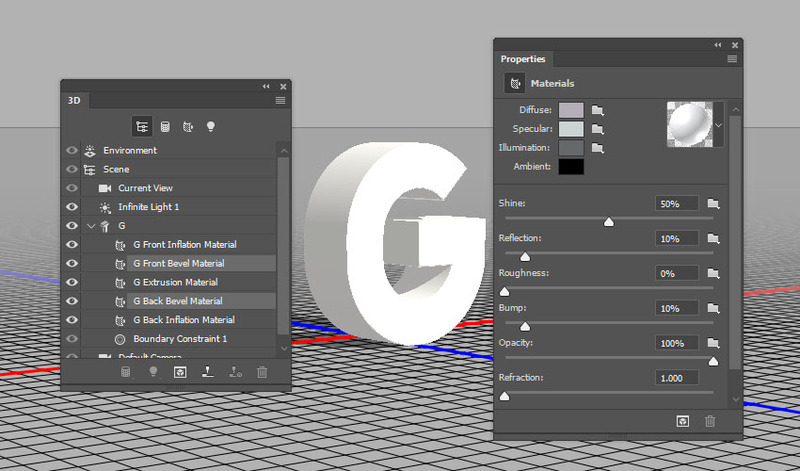 Select the mesh tab, and change its Texture Mapping in the Properties panel to Tile. 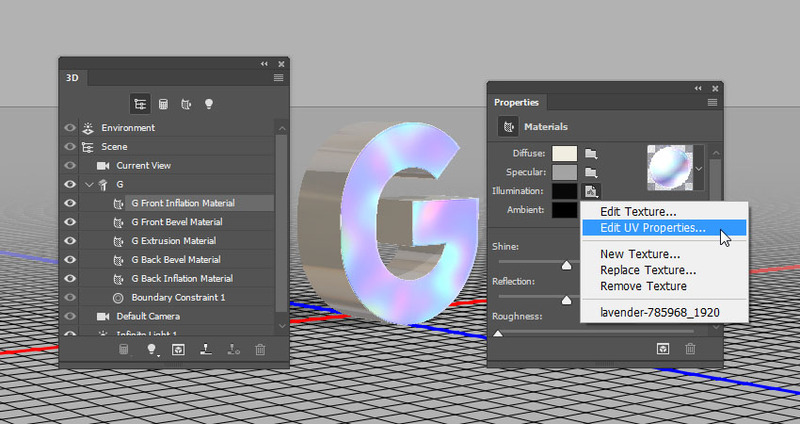 Select the Extrusion Material tab again, and edit the Illumination texture’s UV Properties as needed. 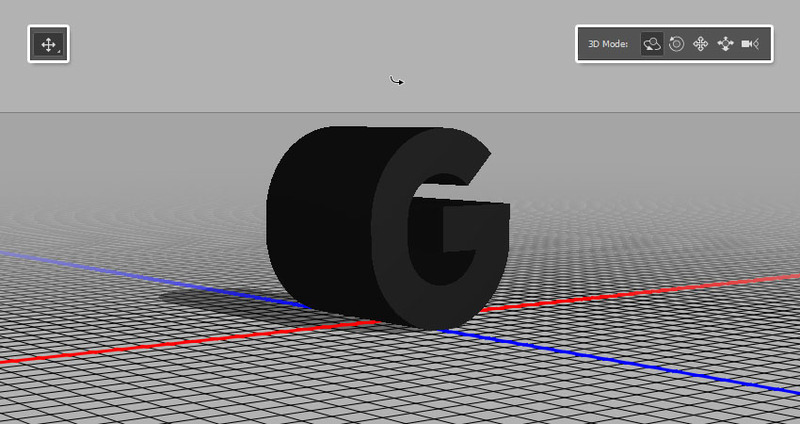 This will update the mesh in the original document. 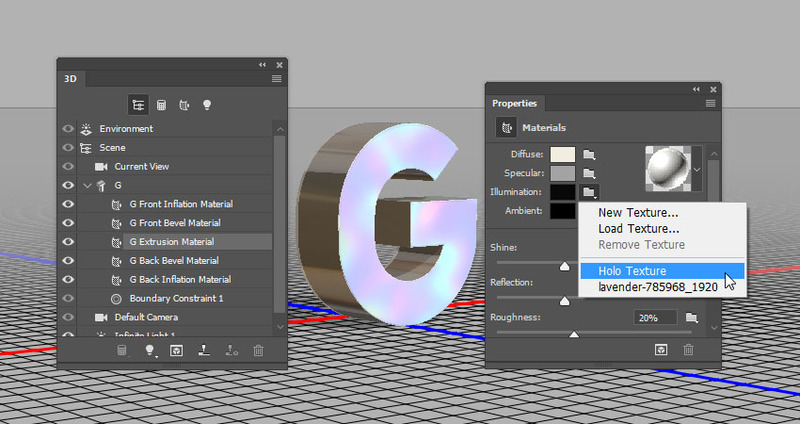 Repeat the same steps to create the remaining letters you need for your text. 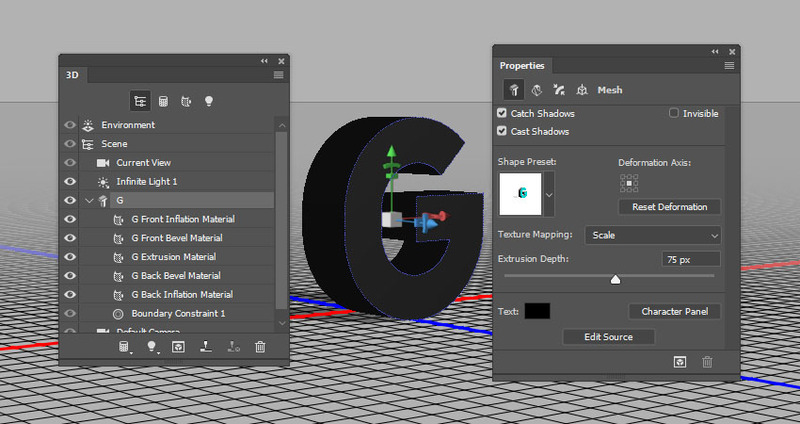 Select the second letter mesh tab, pick the Move Tool, and use the 3D Axis to move it away from the first letter. 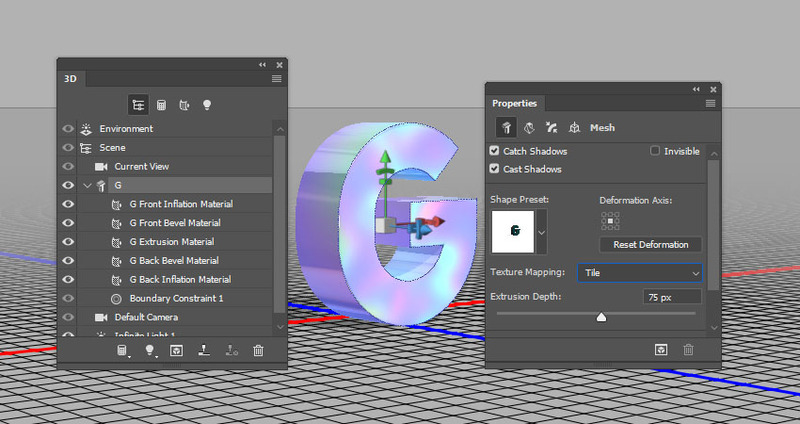 You can click the Current View tab, and choose any of the View menu options to help you place the letter meshes. 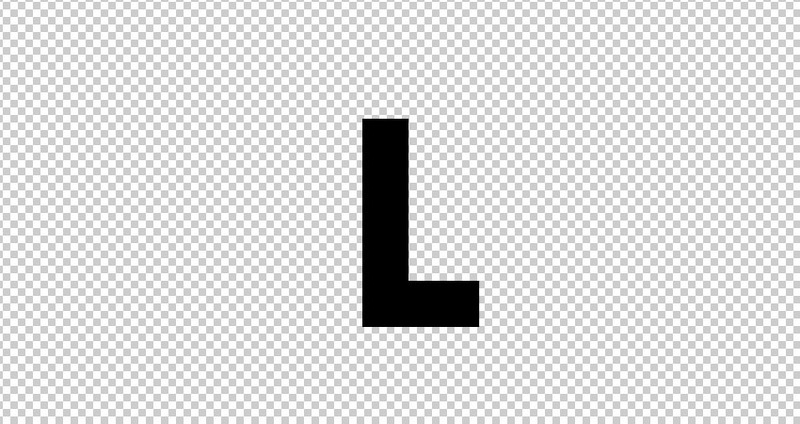 Repeat that until you finish moving all the letters and get a result you like. 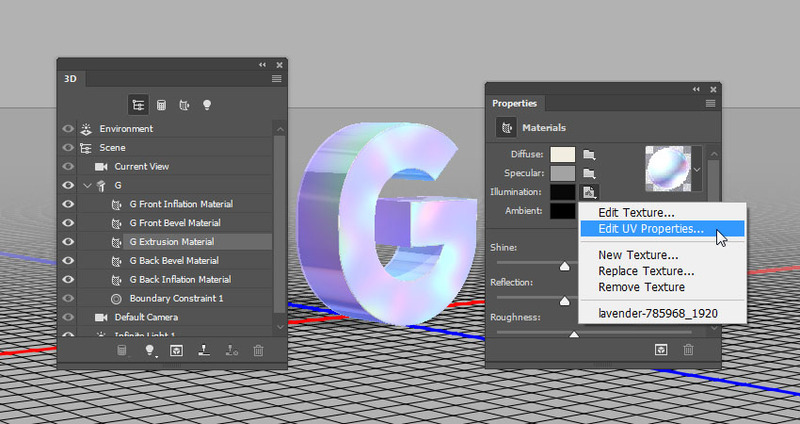 Change the 3D layer name to Text. 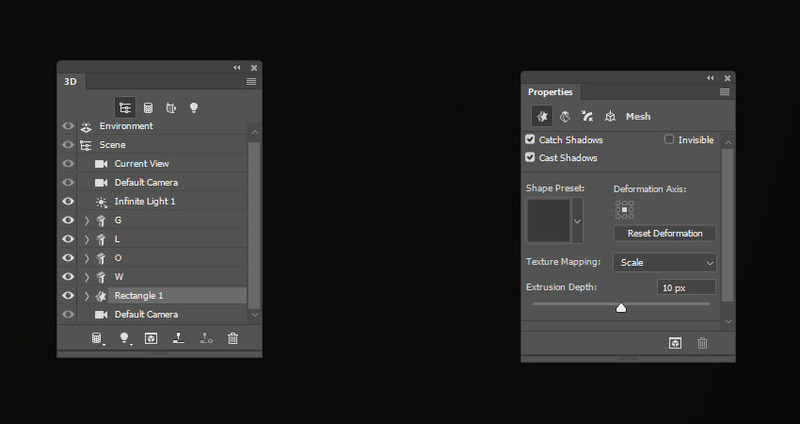 Pick the Rectangle Tool, make sure that the Shape option is active in the Options bar, and that the Stroke is set to None. 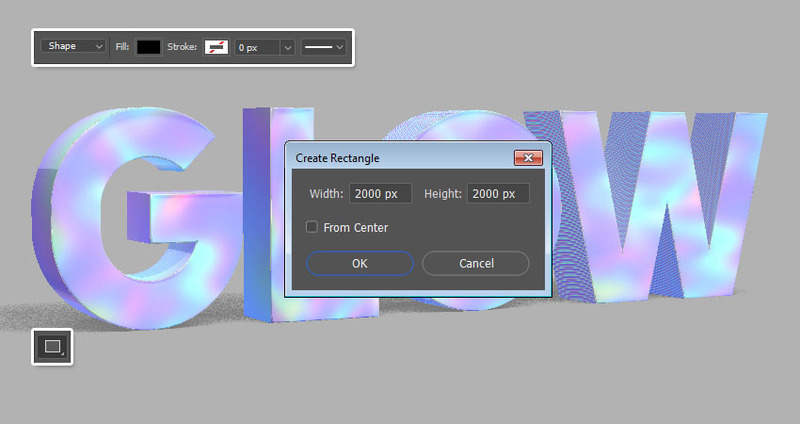 Click anywhere in the document to get the Create Rectangle box, set both the Width and Height values to 2000, and click OK.
Go to 3D > New 3D Extrusion from Selected Path, click the Current View tab, and choose Text from the View menu to match the views of both 3D layers you have. 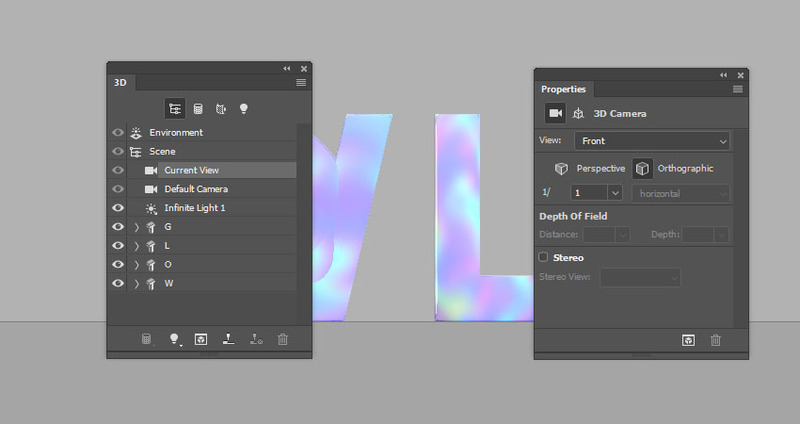 Select the two 3D layers you have and go to 3D > Merge 3D Layers. 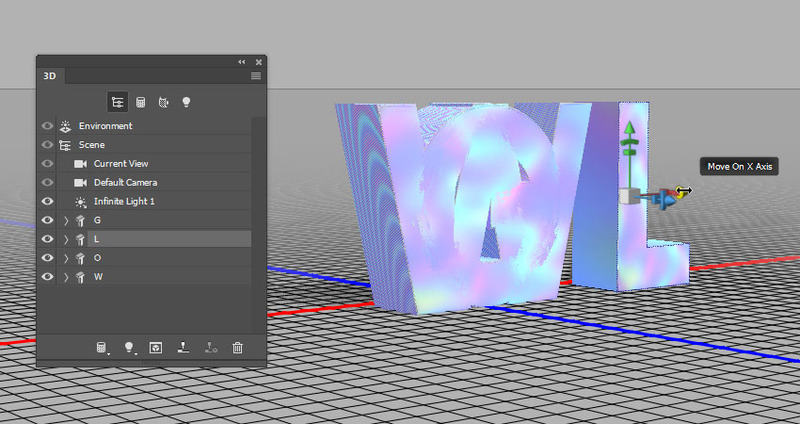 Change the Rectangle mesh Extrusion Depth to 10. 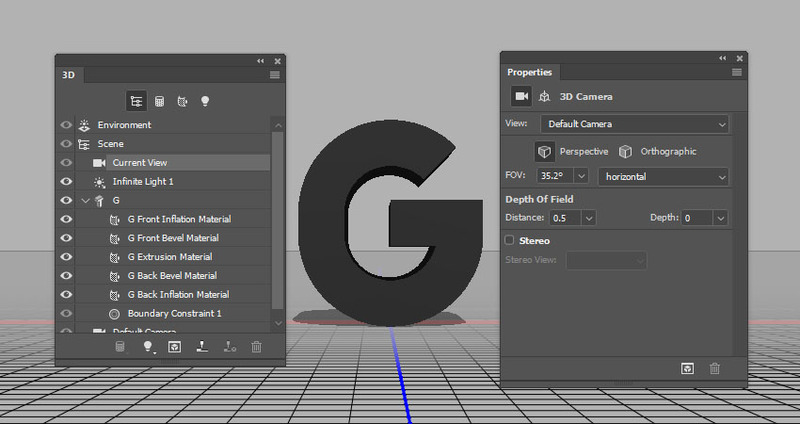 Move the Rectangle mesh behind the text. 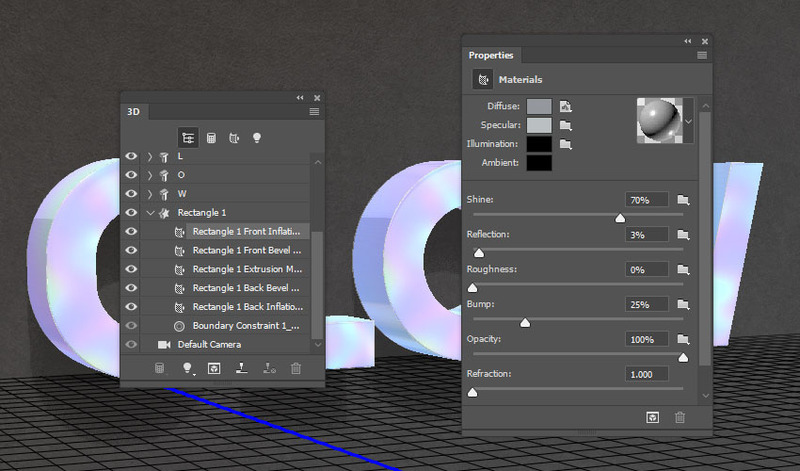 To create a Bump texture, click the Bump folder icon and choose New Texture. 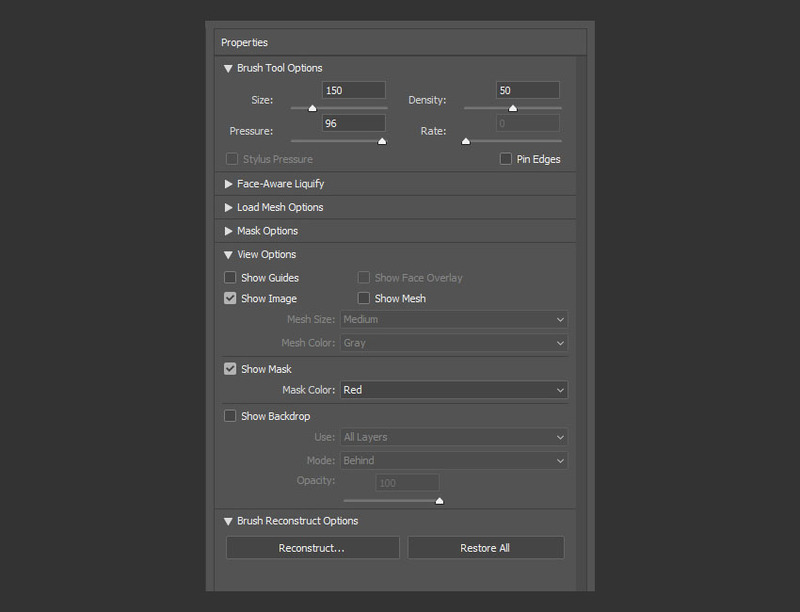 Set the Width and Height values to 1000 and click OK.
Save and close the file, and adjust the Bump texture’s UV Properties as needed. Select both 3D mesh tabs, and move them along the Y-Axis above and away from the Ground Plane, so that it won’t affect the reflections. 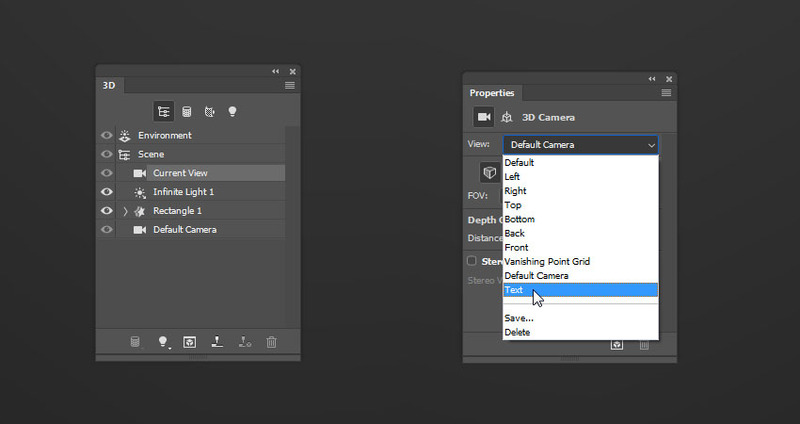 Choose a final camera view and make sure that the background Rectangle mesh is covering the document and not leaving any empty corners. 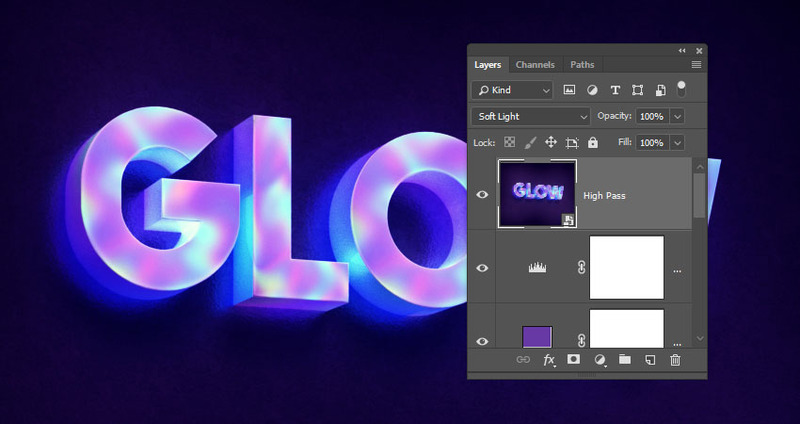 Add a Gradient Map adjustment layer on top of all layers, check the Dither box, and create the gradient using the Colors #403261 to the left, #554561 in the middle, and #97846b to the right. 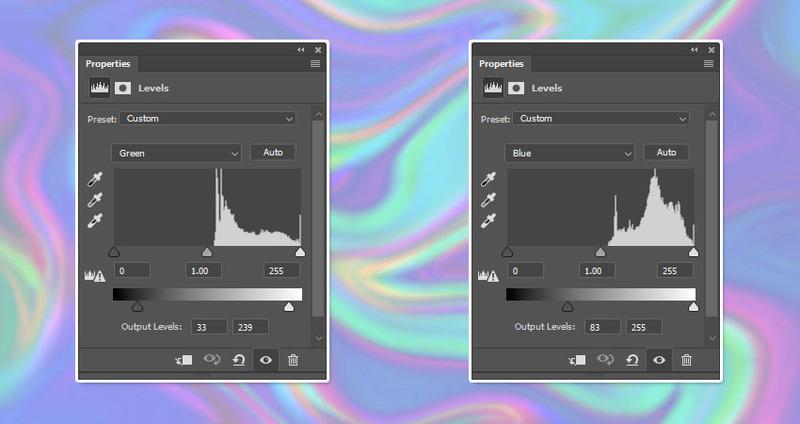 Change the layer’s Blend Mode to Soft Light and its Opacity to 70%. 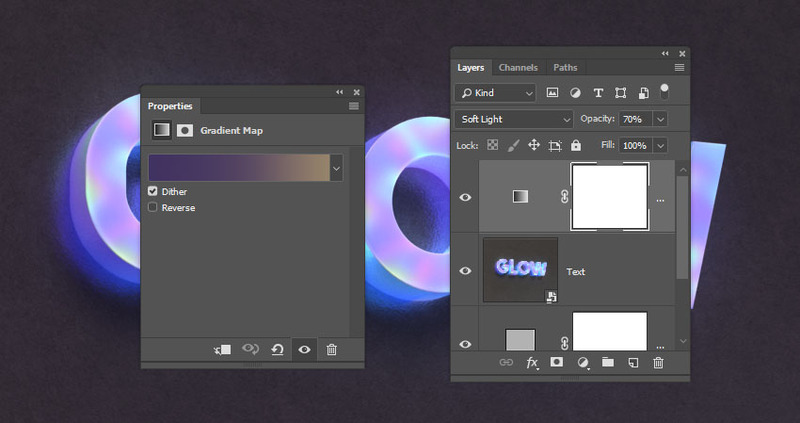 Add a Color Lookup adjustment layer, choose the Pastel 8 Hues table from the Abstract menu, and change the layer’s Blend Mode to Soft Light and its Opacity to 20%. 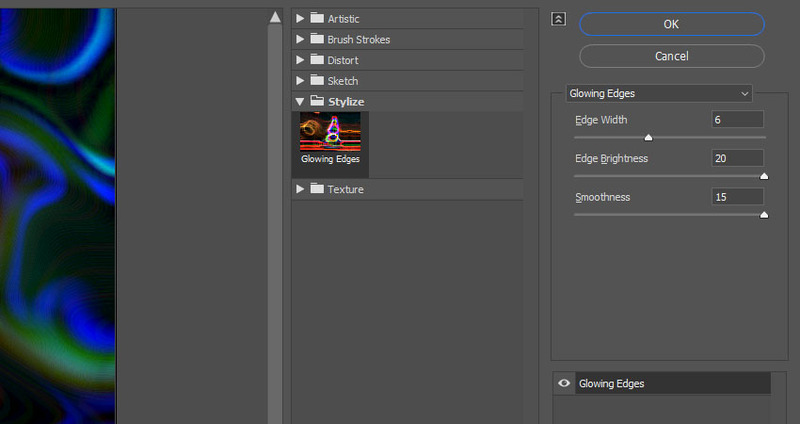 Create a new layer on top of all layers, name it Vignette, and change its Blend Mode to Color Burn and its Opacity to 70%. 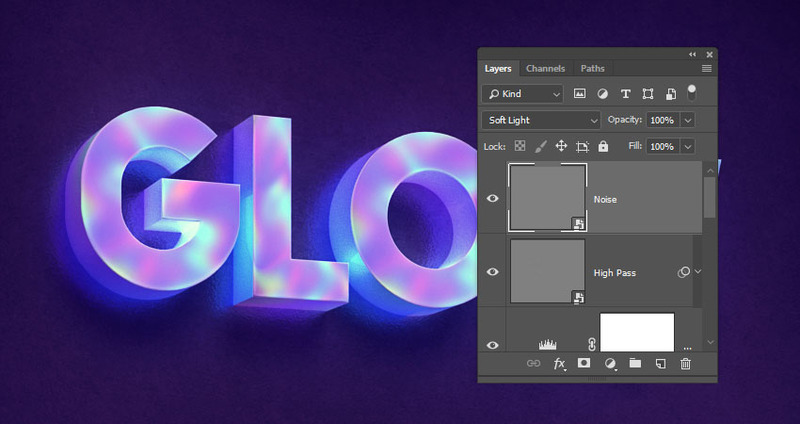 Pick the Brush Tool, set the Foreground Color to #707070, and choose a big soft round tip to add vignette all around the text. 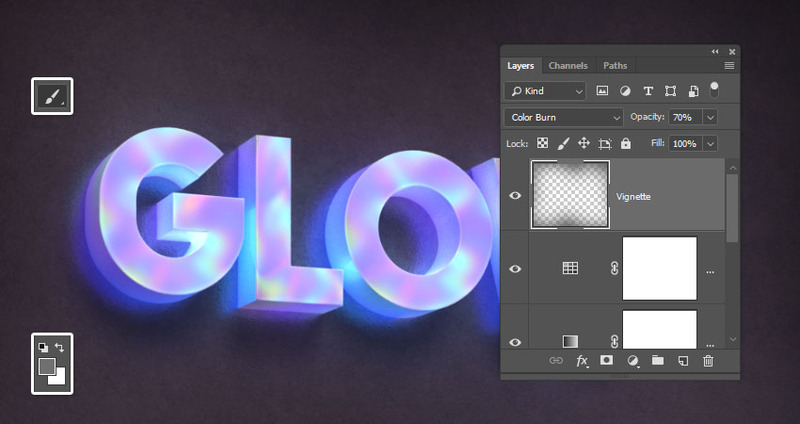 Add a Solid Color fill layer using the Color #6639a4, and change its Blend Mode to Soft Light. 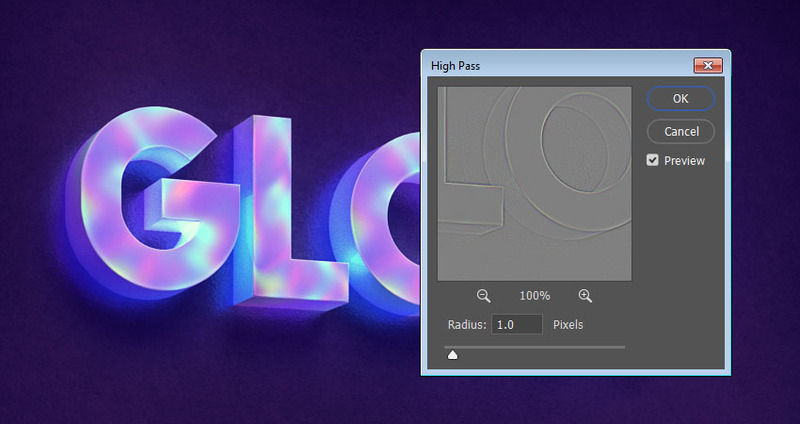 Add a Levels adjustment layer, and change the Shadows value to 10. 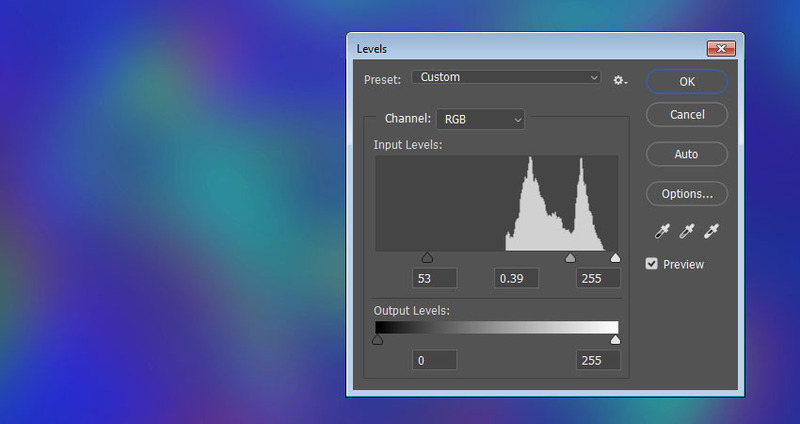 Then, choose the Blue channel, and change its Output Levels values to 15 for the Shadows and 236 for the Highlights. 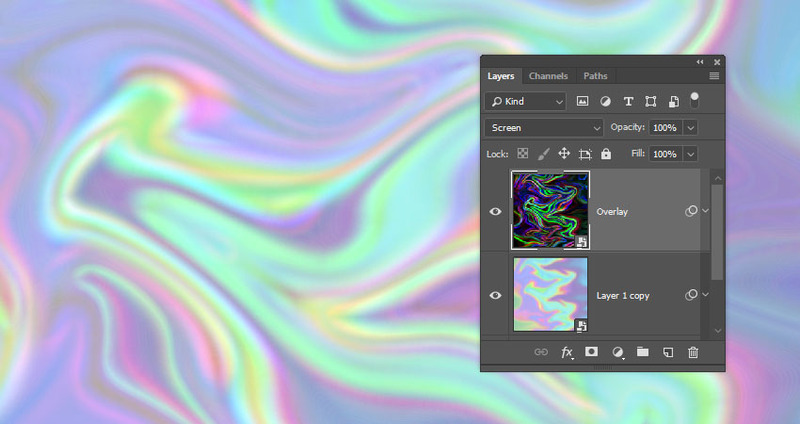 Create a new layer on top of all layers, name it High Pass, and create a stamp of all the layers you have. 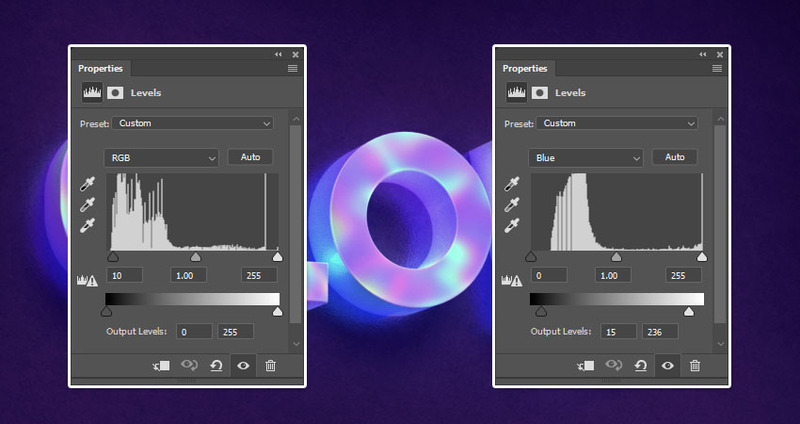 Convert the layer to a Smart Object, and change its Blend Mode to Soft Light. 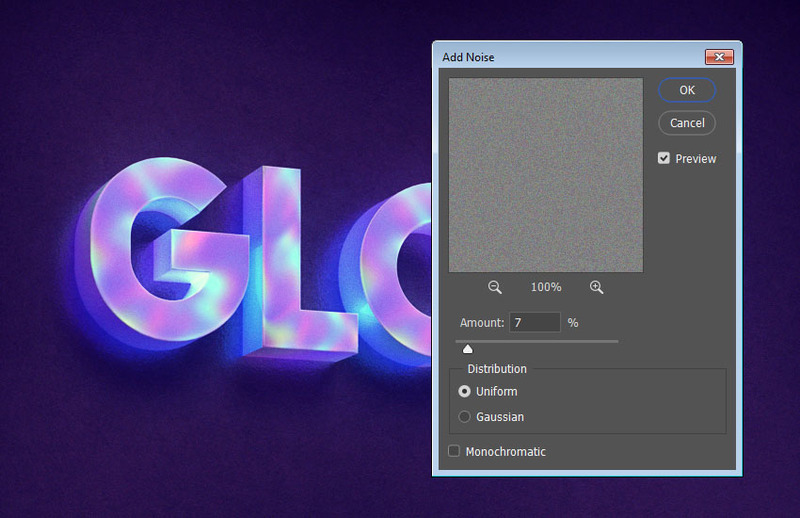 Go to Filter > Noise > Add Noise, change the Amount to 7, the Distribution to Uniform, and uncheck the Monochromatic box. 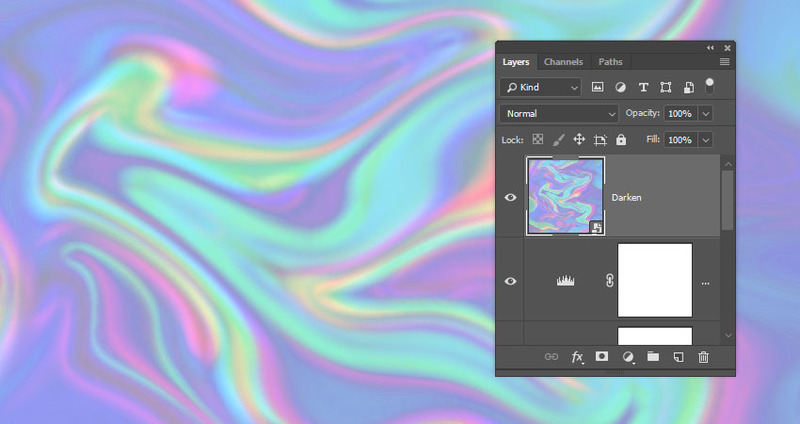 Place the Black Grunge Texture 2 image on top of all layers, resize it as needed, and change its layer’s Blend Mode to Color Dodge and its Opacity to 50%. 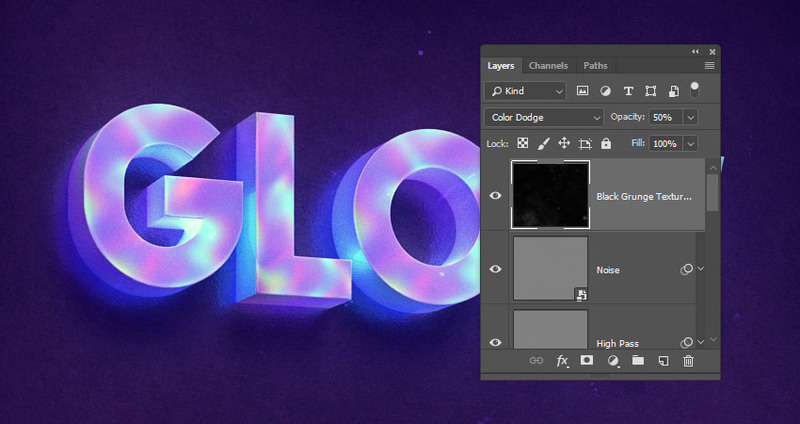 In this tutorial, we used a bunch of layer styles, filters, and adjustments to create a hologram texture. 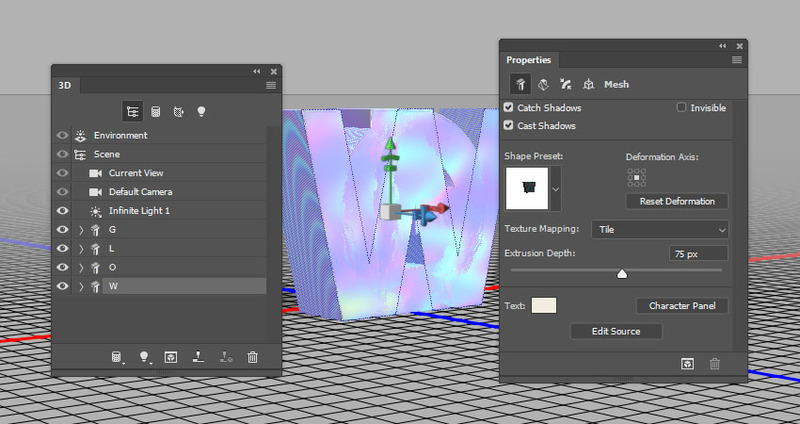 Then, we created 3D text, adjusted its settings, and created its materials. After that, we adjusted the lighting, added a background, and rendered the 3D scene. 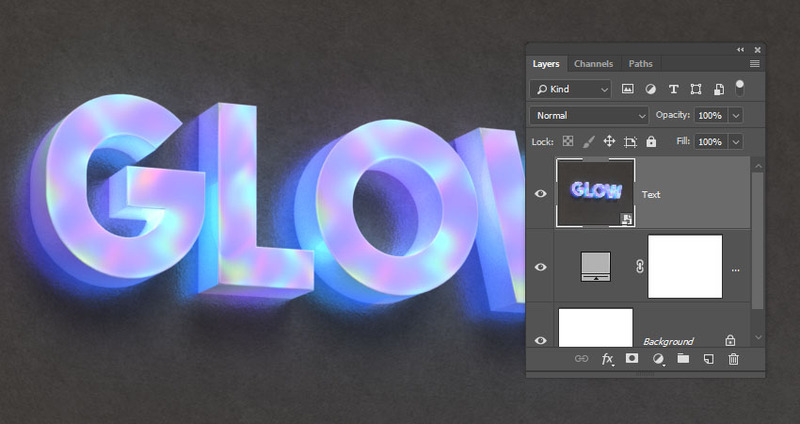 Finally, we added some more adjustment layers and texture overlays to finish off the effect.